Made with pudding, pumpkin, whipped cream and cookies, Pumpkin Pie Parfaits are a special fall dessert recipe for Halloween, Thanksgiving or a dinner party. Tired of traditional pumpkin pie? 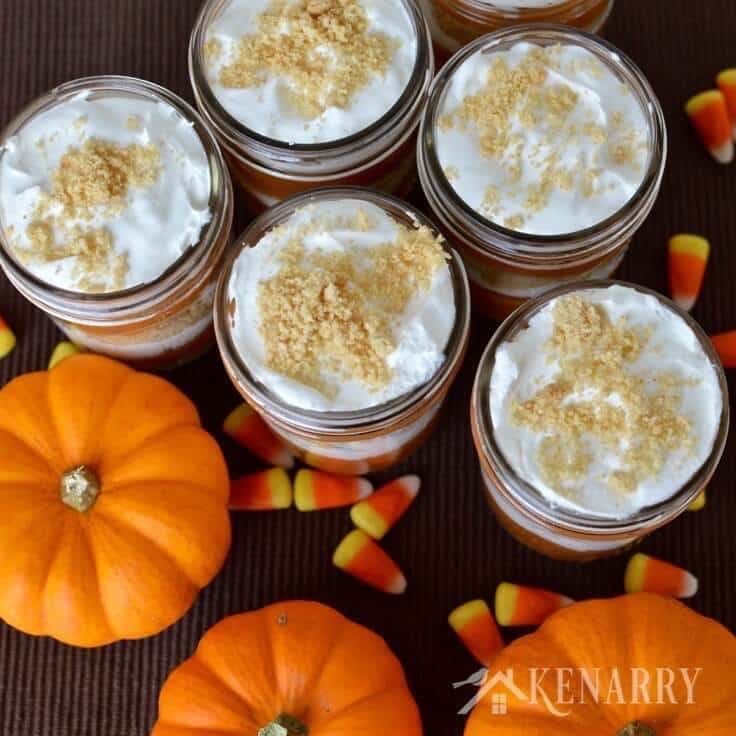 You’ll love these Pumpkin Pie Parfaits, a delicious dessert layered and served individually in small mason jars. One of my absolute favorite things about fall are pumpkins. I love the rustic orange color and the scent of cinnamon and nutmeg wafting through the house. Pumpkin spice lattes, pumpkin bars, pumpkin muffins, pumpkin carving, pumpkin seeds, pumpkin home decor… I could go on and on. My kitchen walls are even a warm, pumpkin color! The quintessential pumpkin dessert of the season of course, is pumpkin pie. You’ll find it at nearly every Thanksgiving table in North America this fall. I thought it would be really fun to take this traditional dessert and give it a special little twist. 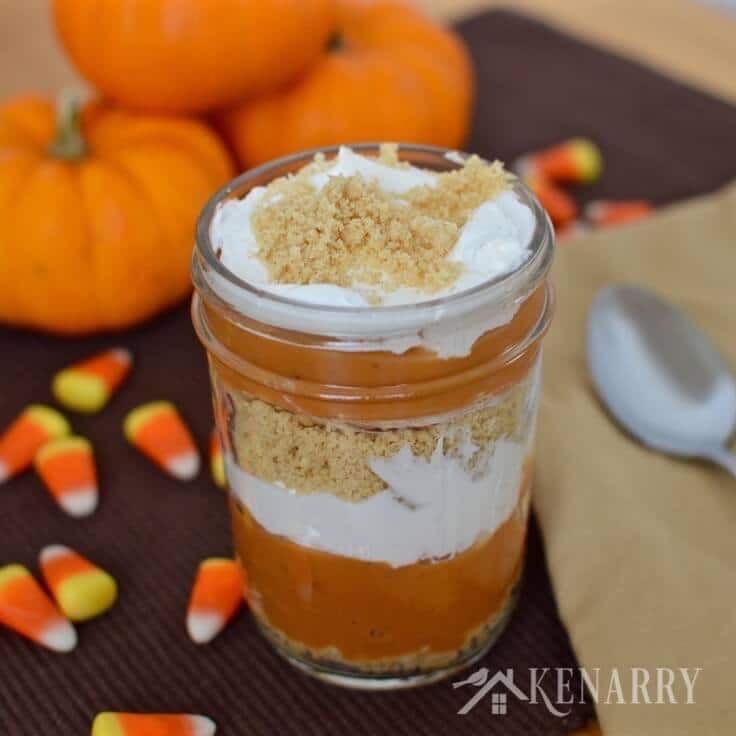 These Pumpkin Pie Parfaits have all the flavor you love about pumpkin pie wrapped up in a cute little half pint jar. 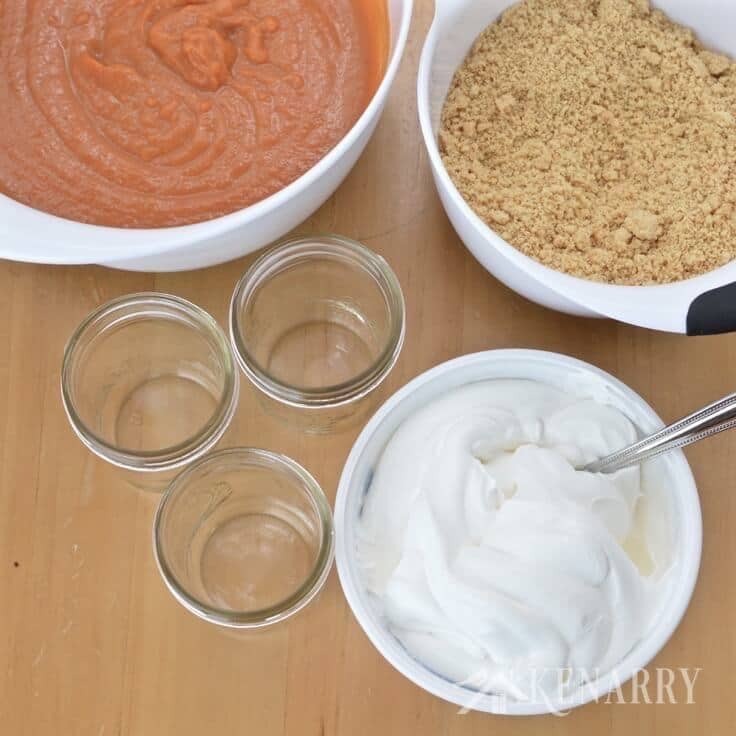 I originally shared this recipe for Pumpkin Pie Parfaits at Belle of the Kitchen a few weeks ago. When Ashlyn from Belle of the Kitchen and I were talking about a theme for our October “Ideas for the Kitchen” exchange, the choice was obvious: PUMPKIN! While I was there, Ashlyn was here with her delicious recipe for Pumpkin Sheet Cake. 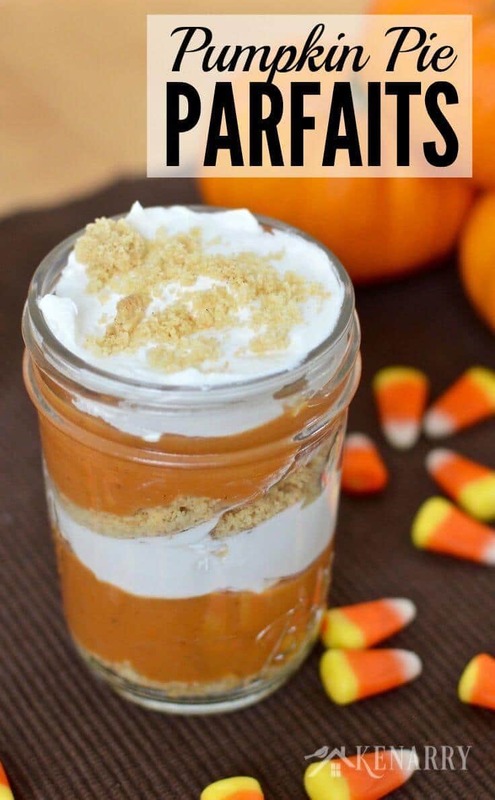 Pumpkin Pie Parfaits are a really easy fall dessert idea to make ahead of time for your Halloween or Thanksgiving party. 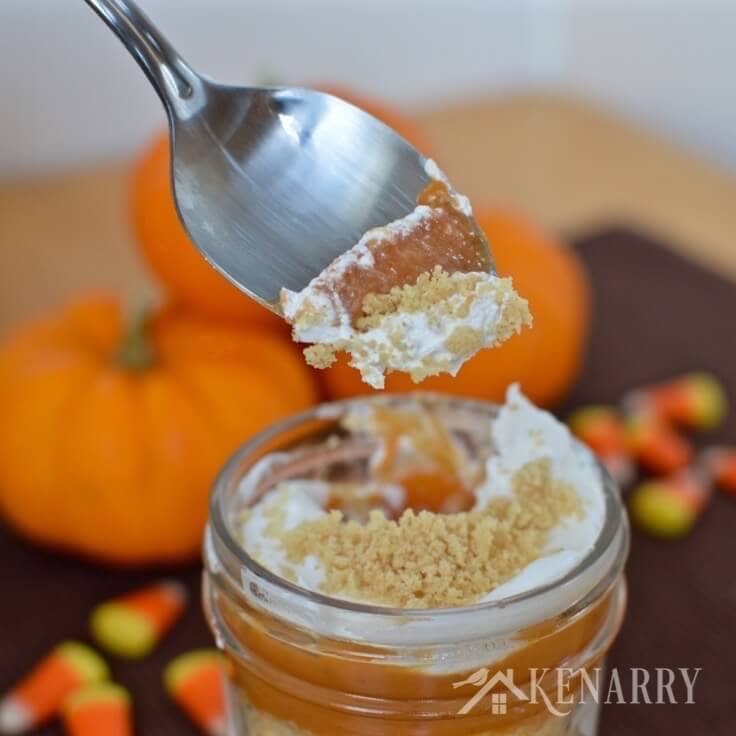 With layers of pumpkin spiced pudding, whipped topping and cookie crumbs, the Pumpkin Pie Parfaits are a delicious treat your friends will love! You start by combining vanilla pudding with a can of pumpkin and some traditional pumpkin pie spices like cinnamon, nutmeg and ground cloves. Next, you thaw a small tub of frozen whipped topping, crush some vanilla sandwich cookie crumbs and line up nine half pint jars. 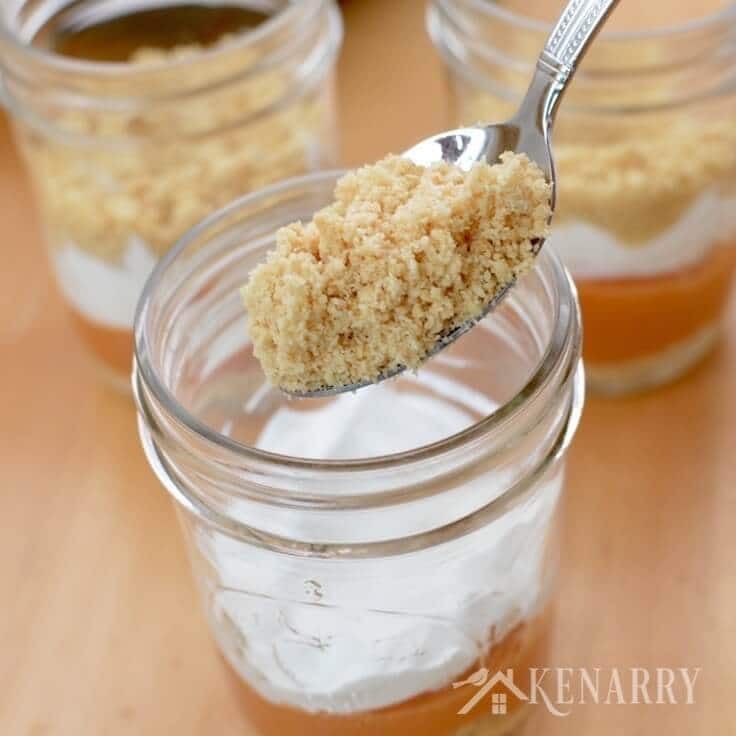 Layer the ingredients in half pint jars starting with the crushed cookie crumbs, followed by pumpkin spiced pudding and whipped topping. The layers don’t have to be precise amounts. I used a few teaspoons of cookie crumbs, a large tablespoon or two of pumpkin spiced pudding and about one and a half tablespoons of whipped topping for each of the layers. Repeat the layers of cookie crumbs, pumpkin spiced pudding and whipped topping twice in the jars. Sprinkle the remaining cookie crumbs on the top as a little garnish. 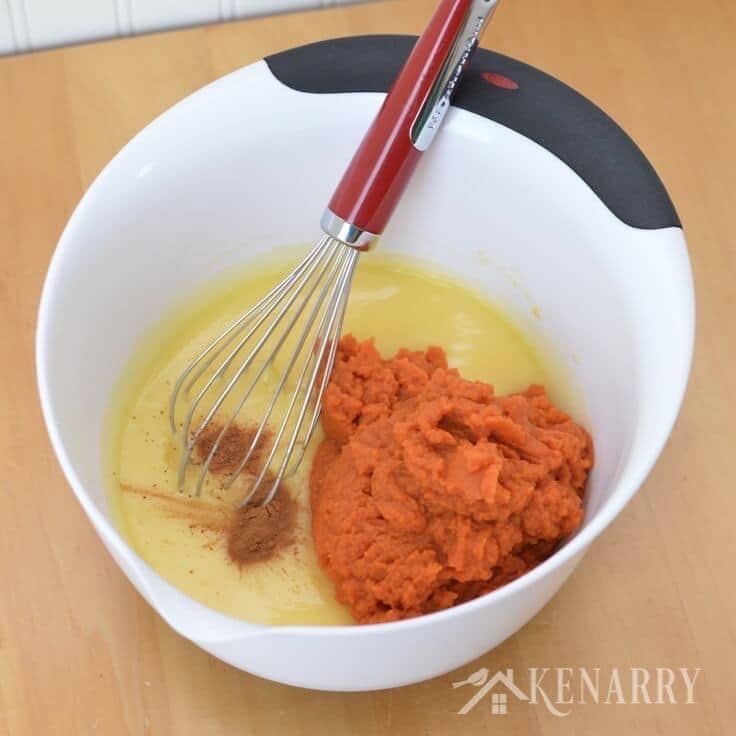 In a large bowl, whisk together pudding mix and milk. Let set for 5 minutes. Stir in pumpkin, cinnamon and nutmeg. Crush the vanilla sandwich cookies in a blender or food processor to make crumbs. 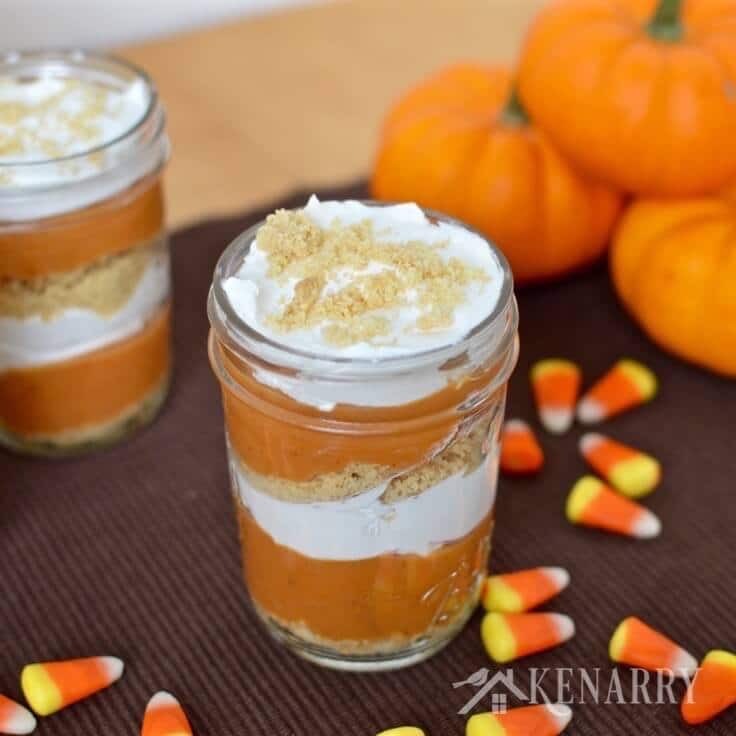 In small 1/2 pint jar or glasses layer cookie crumbs, pumpkin pudding and whipped topping. Repeat the layers twice and end with cookie crumbs. Chill until you're ready to serve. Enjoy! Instead of topping the Pumpkin Pie Parfaits with cookie crumbs, you could use fall colored sprinkles, candy corns or crushed nuts like pecans or walnuts to decorate the parfaits. Mix crushed peanuts with the cookie crumbs to enhance the nutty flavor of the Pumpkin Pie Parfaits. Tie a little raffia ribbon around the top of the jars to give them some rustic style for your dinner party. 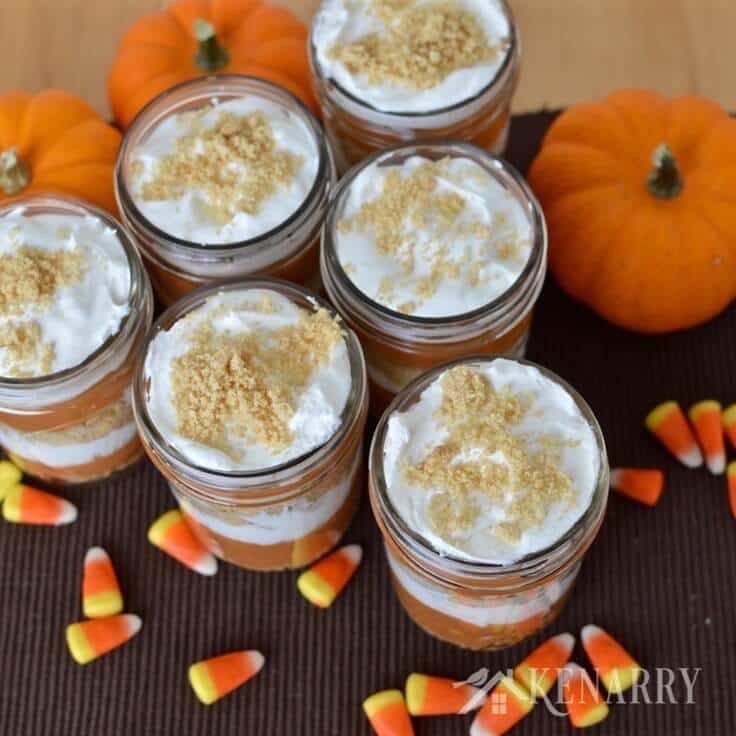 Instead of the half pint jars, you could also use 8 ounces glasses or dress up the Pumpkin Pie Parfaits by using wine glasses or champagne flutes. If you’re short on time or planning for more than nine guests, you could layer the pumpkin spiced pudding, cookie crumbs and whipped topping in a large trifle bowl. It would still look festive and your guests could scoop it into small dessert bowls themselves. What’s your favorite pumpkin dessert for fall? Please comment below and share. We are always looking for new ideas! And of course, Ashlyn’s recipe for Pumpkin Sheet Cake. We also have several easy dessert recipes that are delicious for fall too, like Caramel Apple Pudding Cups. 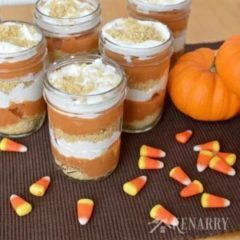 I love this pumpkin recipe and especially like the use of the jars for individual servings! Thanks for giving my family a new recipe to try! Thanks, Pam! Don’t you just think everything is better in cute little jars? Hope you and your family enjoy the dessert. Such a pretty dessert! I love the jar idea. Thanks Debbie! It’s as delicious as it is pretty too. I hope you enjoy it. Love pumpkin anything. I going to give this recipe a try! Me too, Ann! Me, too. Pumpkin and fall just go hand in hand, don’t you think? Theres look so yummy and fun! Perfect for Thanksgiving dessert! Thanks for sharing on the #MondayFundayParty! I’m so glad you came over from your party to check out our recipe, Amy. Thank you! These look amazing! Pinned it and can’t wait to try them. Blessings always. Misty. Hope you enjoy them, Misty! Thank you so much for pinning the recipe. This looks so delicious! 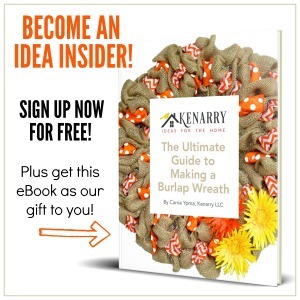 I’ll be making this one. Thank you. Great! Hope you love it, Carol. I bet they will, Lynn! If the grandkids are anything like my boys, they’ll love them! These will be perfect to take to Thanksgiving dinner. I just love that everyone gets their own in a darling little jar. Thanks for sharing! I bet if you screwed the lids on the jars they’d travel fairly well for the holidays, Susan. I’d just wait to put the final layer on once you got to your Thanksgiving dinner. love this unique idea for Thanksgiving! Yum! pumpkin pie is great and this makes them look super cute and personalized! Tianna, I’m so glad you liked the idea. I bet you actually could personalize them. You could write guests’ names on the jar ahead of time with enamel paint like I did with handpainted wine glasses. Then Thanksgiving guests could take their little jars home like a souvenir from the meal. Wow this sounds yummy and your pics look awesome. Thanks for sharing with us at Throwback Thursday. Please share and join us again next week. Hi Quinn, thanks for coming over to see us and check out the Pumpkin Pie Parfaits. We hope you have a wonderful weekend! Thank you so much for this recipe, I am drooling 🙂 Love that you serve them in the jars! Thank you, Joanita! We’re so honored you chose to feature our recipe this week. I think pumpkin pie may be one of my favorite things from fall and this sounds like an awesome way to make it even better! Who thought it was possible…? 🙂 Thanks so much for sharing it at Turn It Up Tuesday! 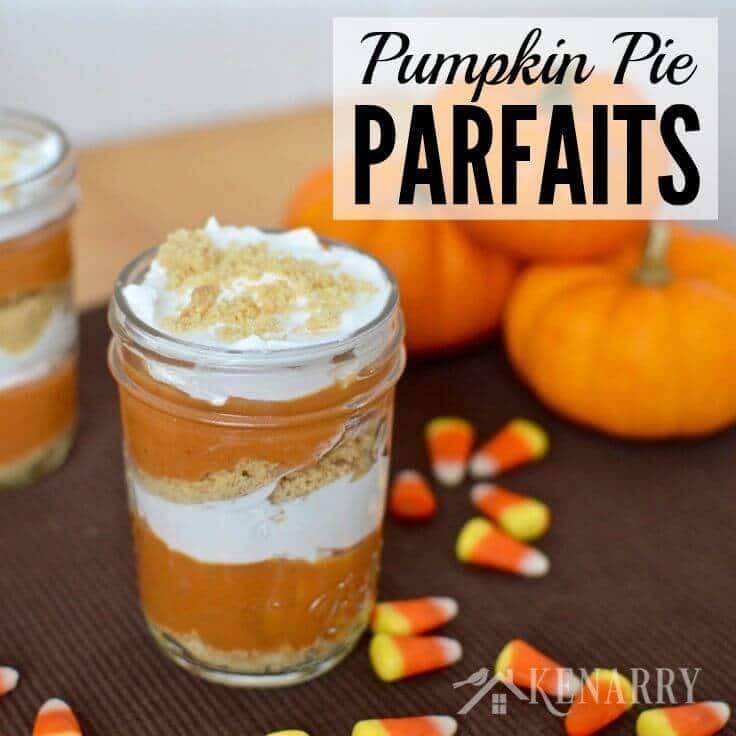 Hi Tiffany, if you love pumpkin pie then you’re seriously going to love these parfaits too. Thank you for much for coming by from Turn It Up Tuesday to check out the recipe. Enjoy! Such a lovely recipe to put together for a dessert and perfect for this time of the year. Thank you for sharing with us at #HomeMatterParty. We would love to have you again next week. Hi Sahana, I agree – pumpkin pie parfaits are perfect for fall! Thanks for coming over from your party to check out the recipe. Maria, I’m so grateful you liked our recipe and pinned it too! Thank you! Thank you so much for including our recipe in your terrific collection, Debi! Have a wonderful Thanksgiving.